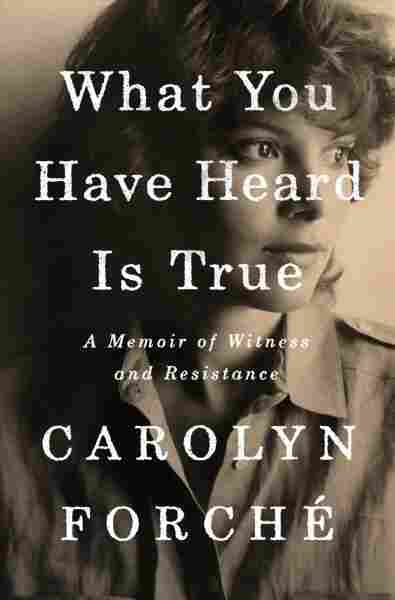 In Carolyn Forché 's 'What You Have Heard Is True,' A Poet Bears Witness To Devastating Civil War Though it took poet Carolyn Forché half a lifetime to fully share in a memoir what she saw during her time in El Salvador in the 1970s and the lessons learned, now is precisely when we need to see it. The poet Carolyn Forché was 27 when a stranger showed up on her doorstep, unrolled a giant sheet of paper on her dining room table, and proceeded to give her a masterclass in Central American geopolitics and the crisis unfolding in El Salvador. "There is soon going to be a war," the man says. This is how What You Have Heard Is True begins. It is Forché's extraordinary memoir of the late 1970s, the years after she published her first book of poetry, when she traveled to El Salvador in the lead up to that country's devastating 12 year civil war, in which tens of thousands were killed. Written with a thriller writer's knack for narrative tension and a poet's gorgeous sentences and empathy, it is also an intimate portrait of Leonel Gómez Vides, the stranger who drove up from El Salvador on a tip from a mutual friend and dramatically altered the course of Forché's life. He was a shadowy and contradictory figure — a revolutionary, an activist and organizer, a political chess player. He worked on behalf of the campesinos (the peasant farmers), was neither on the side of the guerrilla fighters nor the U.S.-backed military dictatorship, and ultimately helped broker peace between the two sides, and the birth of El Salvador's democracy in 1992. Gómez invites Forché to his country, drafting her as a kind of factotum, a witness and helper in his campaign: "you could see quite a bit of the country, I think, and you could learn about the situation, and then you could come back here, and when the war begins, you would be in a position to explain it to the Americans," he says. Much of the book unfolds in the passenger seat of Gómez's car, where his lessons continue. Forché is transformed from a young poet with an unfocused "urge to do something in the face of some wrongdoing or injustice inflicted against another" into the lifelong activist and a "poet of witness" she has called herself since. By Gómez's side, she meets campesinos, mixes with insurgents, endures anxious interviews with military personnel, and evades death squads. Gómez's goal is to show her the contradictory truths of his country, a model of corrupt rule and the careful, painful process by which it is overthrown, so that she can ultimately show us. "What do you see?" Gómez asks again and again. Though it took Forché half a lifetime to fully share what she saw — this time is also more cryptically recalled in her second book of poems, The Country Between Us (1982) — now is precisely when we need to see it. Forché paints a beautiful and chilling portrait of pre-war El Salvador, with its "fields of corn and cane and cotton crops broken by bony, pastured cattle, and along the road, walking the shoulders on both sides, women with clay water urns balanced on their heads, barefoot children following behind them." The campesinos live in houses "made of mud and twigs, and things you would find in a dump," while the colonels own vast mansions. Driving the dangerous roads between the two, Forché sees many victims of the government death squads, "bodies lying on the shoulder of the road, a turkey buzzard alighting on one." In Forché's stark rendering — she struggles at first to accept what she sees, and then her vision gains a camera's coldness — all of this is simply heart-stopping, and feels utterly present, utterly pressing. There may never be a world without corrupt and murderous governments — as the headlines of the last three years more than attest — and so, Forché argues, through the work of description and narration, we must bear witness, must never look away. "It isn't the risk of death and fear of danger that prevent people from rising up," says Gómez, whom Forché portrays as a hero on a massive scale. "It is numbness, acquiescence, and the defeat of the mind. Resistance to oppression begins when people realize deeply within themselves that something better is possible." This lesson, one of many Gómez has for us, is as relevant in today's America as it was in El Salvador 40 years ago. In a small way, this book may help us heed it.